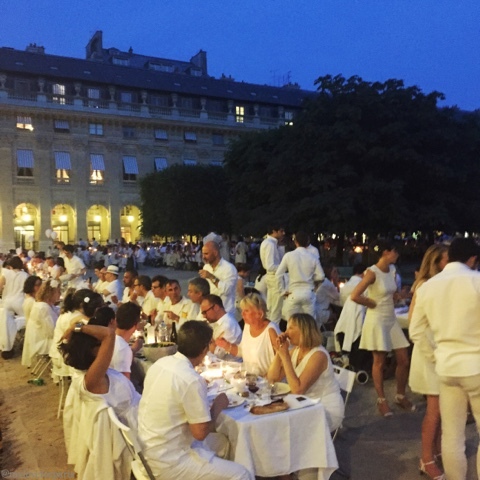 Every year around the same time in June, thousands and thousands of Parisians immaculately dressed from head to toe in white gather for an incredibly surreal impromptu dinner in a public space, the famous Dîner en Blanc. The secret location is only announced at the very last minute, as levels of suspense mount among diners waiting patiently for the all important final reveal. Previous monumental locations have included the Eiffel Tower, Notre Dame, Invalides, Place de la Concorde, the Louvre Pyramid, Trocadéro, Pont Alexandre III and Versailles just to name a few. 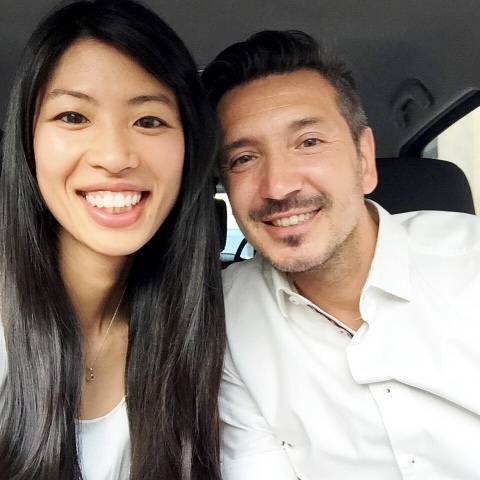 The official event takes months and months of tireless work to organise, the effort involved is a feat in itself as the coordination of 10,000 people dining at a public location is by all means no easy task. 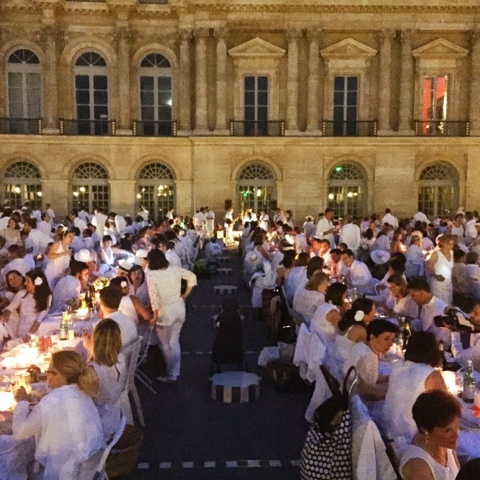 However what makes the event unique and impressive is not the novelty factor of a flash mob dinner nor the publicity nor the media attention that surrounds the event but in fact the genuine desire by those involved to preserve and honour the true Dîner en Blanc spirit. 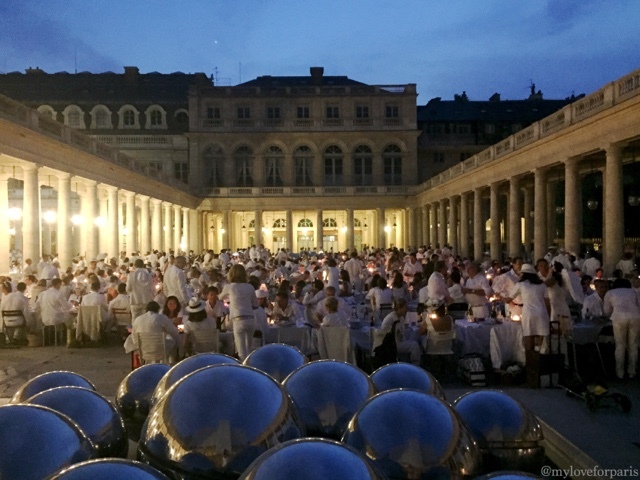 The rules are strict and paramount to maintaining the real essence of the Dîner en Blanc, a desire to celebrate the sacred "art de vivre" with respect, mindfulness and elegance. White chairs, tablecloths, napkins and white attire are expected as well as the preparation of a proper entrée, main and dessert or cheese. No beer or spirits, only champagne and wine. No paper or plastic, only real white crockery and real cutlery. 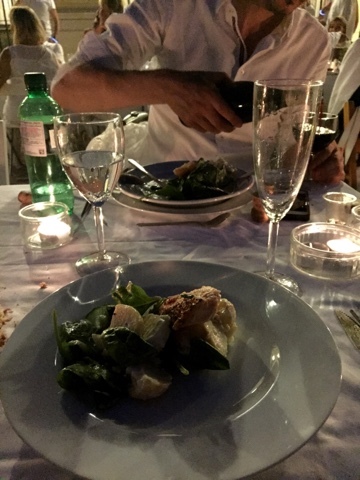 It's the ever present respect for food and the dining experience that is embedded into the DNA of French culture. 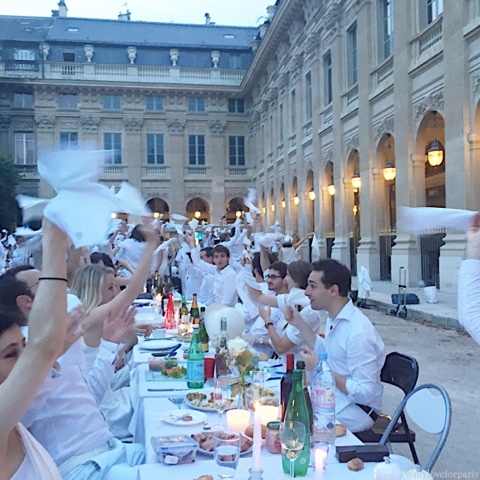 Official diners formally accept an agreement to honour the rules of the Dîner en Blanc, to display the utmost respect for others, for authorities and the police force and to conduct themselves with decorum, thoughtfulness and consideration at all levels. Which means not getting too drunk and making sure when the clock hits midnight, diners pack up their belongings and bring all of their rubbish home with them (not even leaving them at public bins) ensuring that the public space is left in the exact state it was found in. 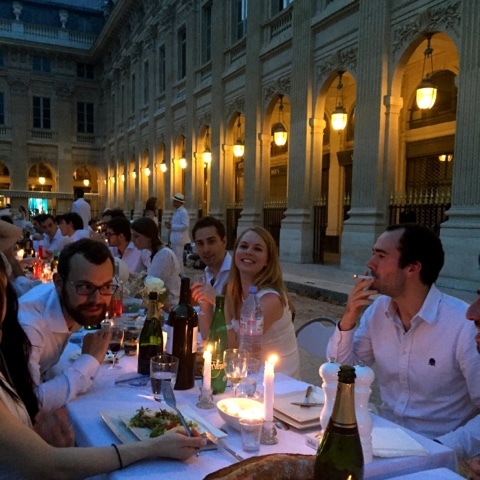 The official event in Paris is exclusive and invite only. You can't buy a ticket nor register to be on a waiting list like other countries where the event has spread to. 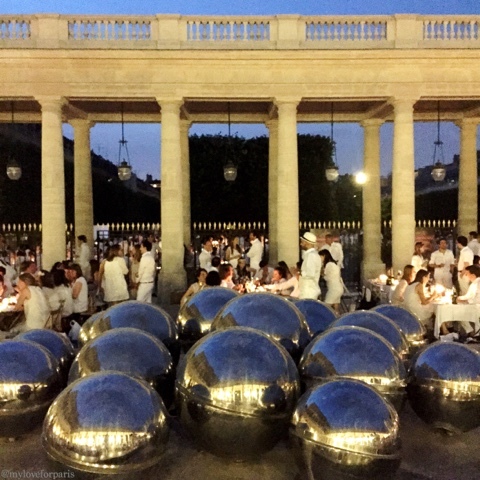 This year, the 2015 Dîner en Blanc event was held at Jardin du Palais Royal (the Garden of the Royal Palace) and the evening from beginning to end was a completely surreal experience. I couldn't believe it when I found out that I was lucky enough to be invited to attend for the first time this year! Thursday June 11th arrived and I had finalised all my bits and bobs. 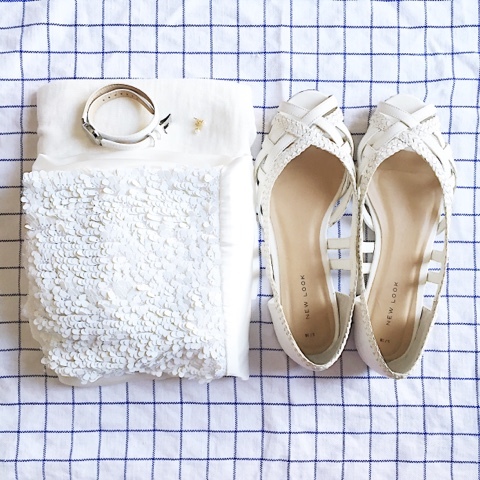 I had ticked off my checklist and had changed into my white dress as soon as I finished work. The pre-meeting point had been revealed that afternoon and Frenchie and I headed straight away to find a car park nearby. We found a park and I sent Frenchie to pick up a fresh baguette even though I knew he would feel a little douchey walking around in public all dressed in white. I told him it would look even douchier if we both walked around in white. 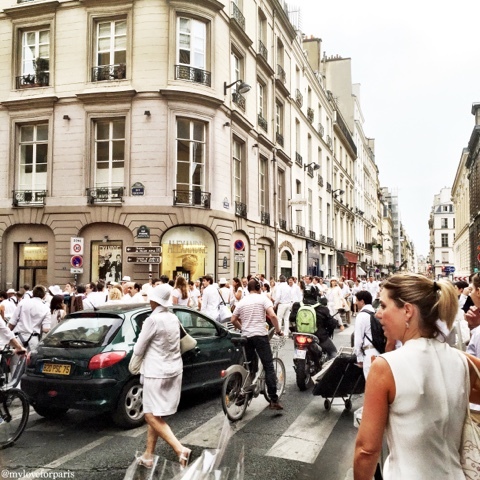 Sitting in the car we started to see others dressed in white carrying tables and chairs walking around the 2nd arrondissement, it was an exciting yet nervous feeling. They were complete strangers, yet in a way they weren't, yet of course they were. 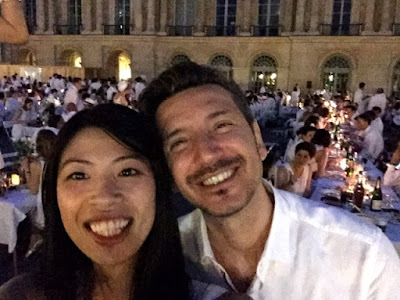 Also, being my very first year at the Dîner en Blanc I wasn't sure how it would work. I was petrified that at the very last minute there would be a problem and my name would not appear on the list! At 8:30pm we headed to our pre-meeting point. Of course this was when Frenchie decided to lose his car keys and we fumbled around at the last minute trying to find it among all our belongings. How were we going to lock the damn car to get to the meeting point in time!? Each group had a different pre-meeting point around the final location in order to stagger and accommodate for the 10,000 guests. If we missed this chaos would follow. We found the car keys in the end (they were in his pocket, but 'so deep' that he couldn't find it - I said it was a 'boy look' and not a 'mum look') and then we scurried along to our pre-meeting point. 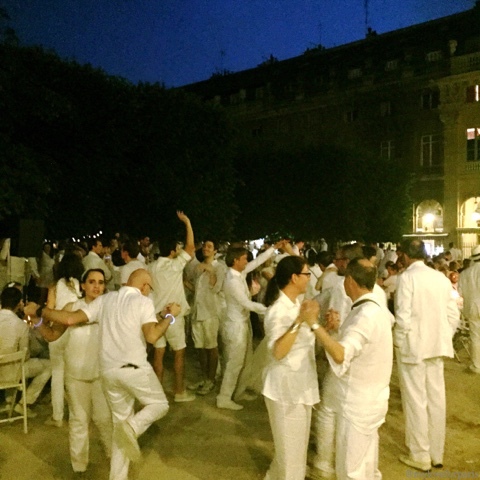 We introduced ourselves to the group exchanging countless kisses as French people do. It always feels better after this is done. As an expat I always feel a little awkward at the beginning looking the group and thinking "okay.. so that's going to be 34 kisses I have to get through". But admittedly, after it's done I feel relieved. Acknowledgements had been made and we had politely and officially introduced ourselves to everyone. Literally every one. At 9pm it was our turn to head to the location, the announcement was made - Jardin du Palais Royal..! I couldn't believe it, I loved this place! I was going to have dinner there, in public! But how were we going to pull it off? The park is normally closed and locked up at 10:30pm I remember thinking. After navigating through bottle-neck traffic and trying to keep with our group lugging along our picnic basket, my cabin bag as well as a table and two chairs, we finally got into the garden. The map was passed around and our designated table number was revealed. What followed afterwards was amazing. The military precision with which our group, like others around us efficiently unpacked our tables and chairs and laid out our white tablecloth, napkins and food was truly impressive. 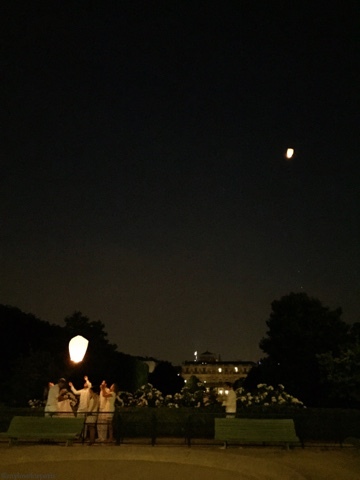 Before we knew it, candles had been lit, everyone had been seated and we were all ready, waving our napkins around to signify the beginning of the evening. 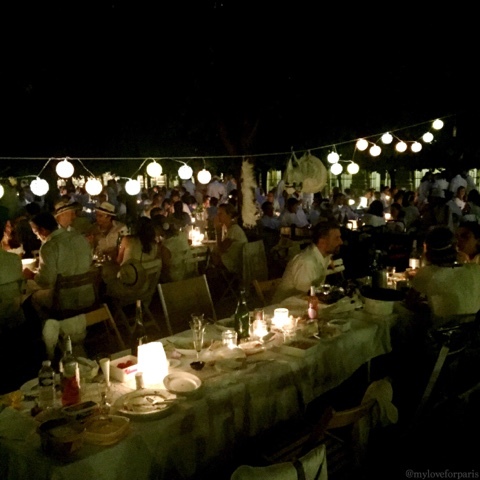 We popped upon the champagne, bubbly spilling everywhere and all toasted to a beautiful night. The sun started to set and I remember thinking, here I am sitting in public sipping champagne and chatting with the couples all in white beside me. Beautiful Parisian architecture was surrounding me as well an ambiance that I couldn't quite describe. 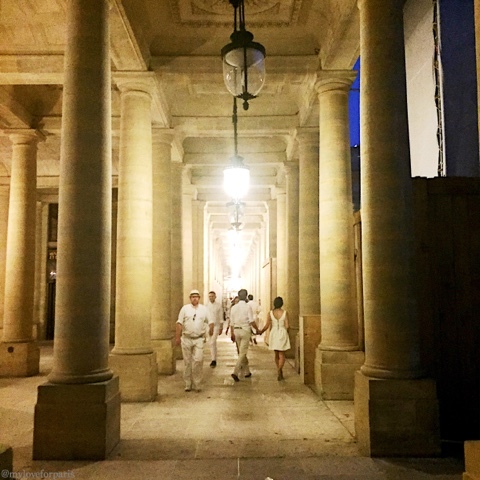 The night went on and Frenchie and I went for a stroll to see the Jardin du Palais Royal in its glory. It felt like a massive outdoor wedding. Couples from all ages and backgrounds enjoying the evening, chatting away, laughing, dining. 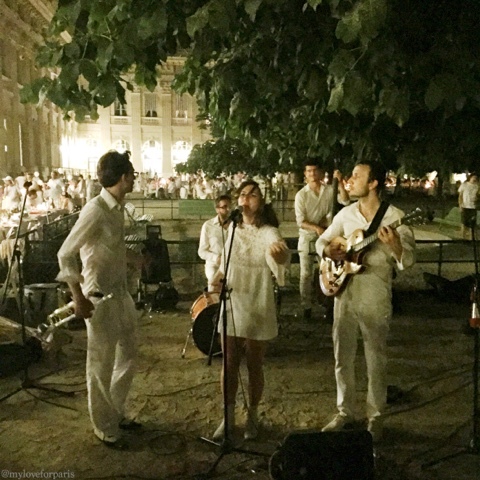 The live bands had started by now and people were dancing away holding their flutes of champagne underneath the stars. At 11pm we took out the little sparklers that were handed to us at the beginning of the night and lit them all at once. The atmosphere was incredible. The wedding feeling had transformed itself into a New Year's Eve feeling (minus the anti-climax that often follows an overrated NYE). We all clapped and cheered, it was time to make the most of the hour that was left. In less than a hour, our Cinderella evening would vanish and our carriages would be turned back into pumpkins. Frenchie and I gobbled down our dessert and hit the dance floor. Actually, correction, I gobbled down my dessert and hurried Frenchie to the dance floor. It suddenly felt like a wedding again! I wanted to skull my champagne but Frenchie protested in shock. Champagne must be savoured and experienced with respect. The Australian inside of me just wanted to knock it back and make it to the band before the song finished. We finished the night having experienced an amazing final hour. Other guests dropped by our table and chatted for a bit exchanging laughs and jokes, a woman went around distributing Dîner en Blanc M&Ms, a lantern was lit and released into the sky and we danced away to the live jazz band before clapping and cheering as the last song finished and marked the end of the night. At midnight, everything was cleared. We took our rubbish with us (specifically home and not dumped at a nearby bin) and packed up our tables and chairs. The Jardin du Palais Royal was left in the state it was found in and the security guards who were meant to lock up the garden at 10:30pm locked up the garden a little later than usual. As Frenchie and I made our way to the car, it started to rain. What a lucky day. 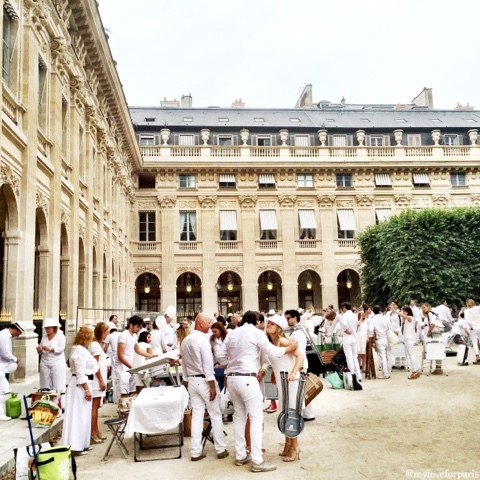 Even the rain had waited for our very first Dîner en Blanc experience to be over before making an appearance. The next morning, I woke up thinking, was last night all a dream..? What an amazing experience that only a few could experience in person.